In my little garden, I have 48 pepper plants. Now before you go thinking I’m crazy, I have to tell you, that in this house we eat a lot of peppers. 40 of these pepper plants are different varieties of red bell peppers, and the rest are all jalapenos. 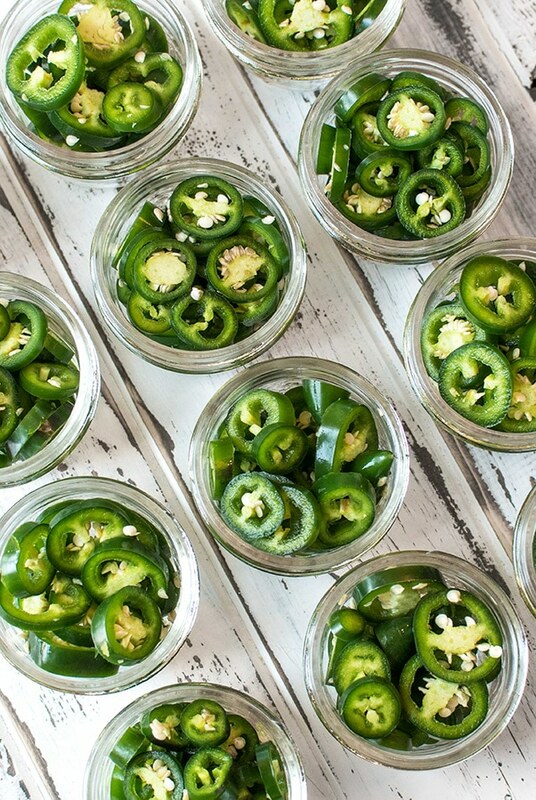 We learned how to pickle jalapenos a few years back, and now we can’t get enough. I pickle enough of the little firecrackers to last all winter. We put them on almost everything. The very first year we moved into this house I built my garden. I was eager, so I started a few hot peppers indoors in January. I had no idea what I was doing. I was bummed when several people told me that my hot peppers didn’t have much of a chance in our short growing season. It’s a good thing I never listen to anyone. Because I planted those peppers anyway and they produced like mad that first year. I didn’t know then what I know now about growing peppers, I just lucked out. I started the pepper plants indoors in January, lopped their heads off in March, and stuck them in the ground mid-June. The sun and the heat did the rest. But starting the hot peppers that early is vital. They need time to grow, and they need a long season to ripen. I don’t have the luxury of either of those things with my 100-day growing season. Lopping their heads off was a lucky rookie mistake. I chopped the heads off because they were growing tall and lanky, due to lack of sufficient lighting. It was a mistake that proved very beneficial. Cutting off the pepper plants top node creates the second node, and the plant produces more than what it would if it was allowed to grow single. There is a great debate around the internet about this process. I can only tell you of my recent experiences. In the years where I snipped the top of peppers plants, the yields were MUCH better than in years where I did not. My eight jalapeno plants from this year produced so much I had to give much of it away. The rest I pickled to eat all winter long. 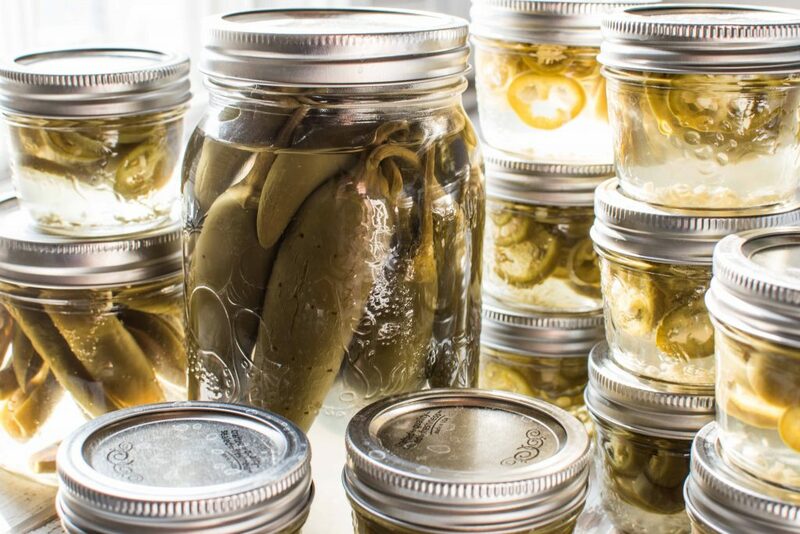 Once you know how to pickle jalapenos, you will always make room in your garden for a plant or two. So what do you eat with pickled jalapenos? 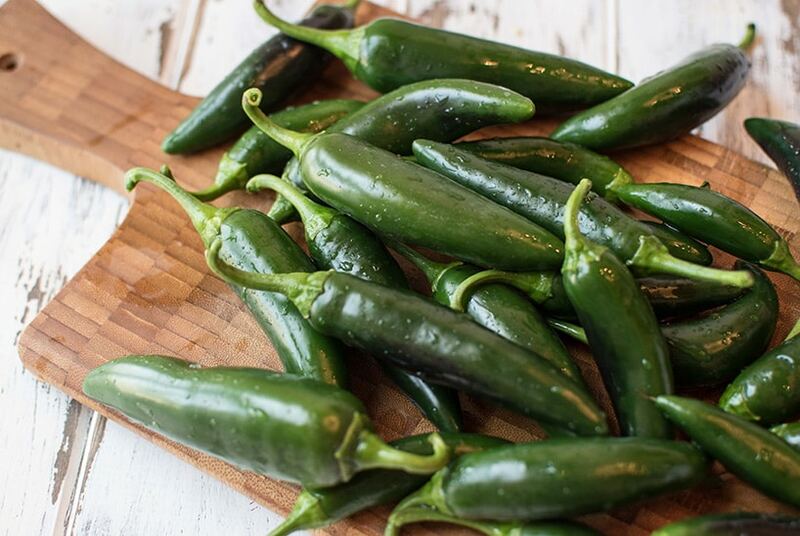 Pickled jalapenos are spicy, pickled, lip puckering additions to any of your Mexican meals. We love them in tacos, on top of nachos and enchiladas. But we also use them around the kitchen to punch up sandwiches, add to burgers, spice up eggs, mix with cream cheese to have with crackers. My husband likes to add them to grilled cheese sandwiches, and I have to admit, they make a boring grilled cheese pop with flavor. I mean if you can think of it, we probably tried adding pickled jalapenos to it. I made 12 pints last year, thinking that was MORE than enough, but they were gone before summer hit. This year I made even more and branched out learning how to pickle jalapenos whole. But honestly, a pantry filled with a few bottles of pickled jalapenos, homemade pickles, jams, fresh tomato sauce (and the list goes on) is probably the best thing for anyone who likes to cook. I feel these fun pantry staple items add a uniqueness to your cooking that you simply can’t buy at the store. So where do you get your fresh jalapenos? I was a bit gobsmacked over the price of a few jalapenos at the grocery store. Where I live, four peppers ran $5.00. Say what? Not in this lifetime. Now granted, I am in Northern Canada, and jalapenos are not just growing on the side of the road, they do take a bit of care to grow here, but still, a buck a pepper seems a tad excessive. I raised my jalapeno peppers from seed, so my cost was pennies. Even if I bought plants at the greenhouse, they are still way cheaper than buying the peppers at the grocery store. Your mileage here may vary, I bet in the south you can pick up bags for a few dollars. Where I live, it is not at all price savvy to buy and pickle your jalapenos. Grow em; it is the best way. 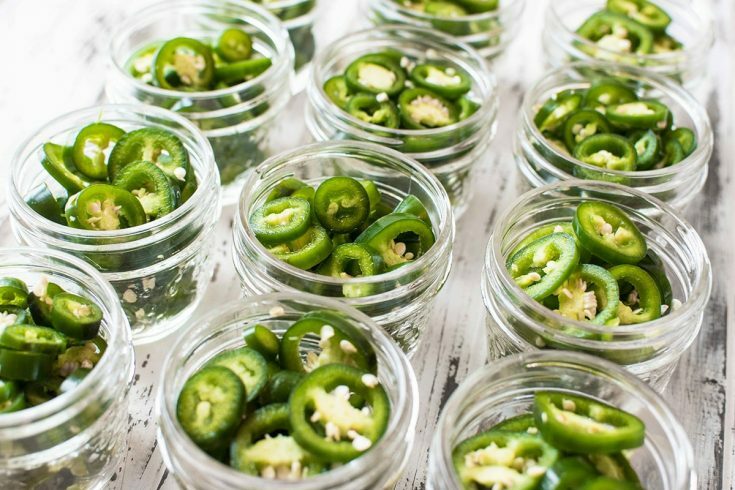 How to pickle jalapenos is super easy. It’s not at all complicated and does not require a lot of time or special ingredients. I do not add anything to my pickled jalapenos, no garlic, no oregano, nada. I want a nice simple tasting pickled pepper that tastes like jalapenos. But if you like garlic and want some oregano, my thought is to go ahead and make them how you want. I find I don’t like peppers with a lot of flavor additions and want my jalapenos to taste like jalapenos, but that’s just me. I use a plain brine, and they taste fantastic after a few months in storage. I’ve detailed my process as well as a few tips and tricks in step by step instructions below. 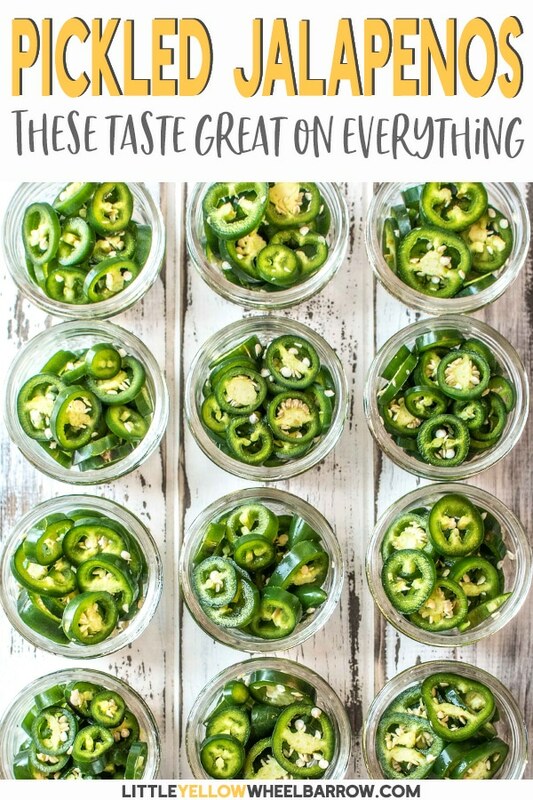 But if you are after the simple how to pickle jalapenos recipe instructions, scroll down to the bottom of the post. Clean and sterilize your jars, and set aside your rings and covers. I prefer to package my pickle rings in 1/2 pint jars. They are perfect for us for a meal or two, or to add a few to a sandwich. I do not have to worry about a larger container going to waste if we do not get through it on time. Of course, if you want to package them up in larger jars, go ahead. The processing time will be a bit longer for quarts, vs. pints, vs. half pints, but it does not affect the outcome. Clean jalapenos under fresh cool water. Dry, and allow to sit out on the counter to reach room temperature. 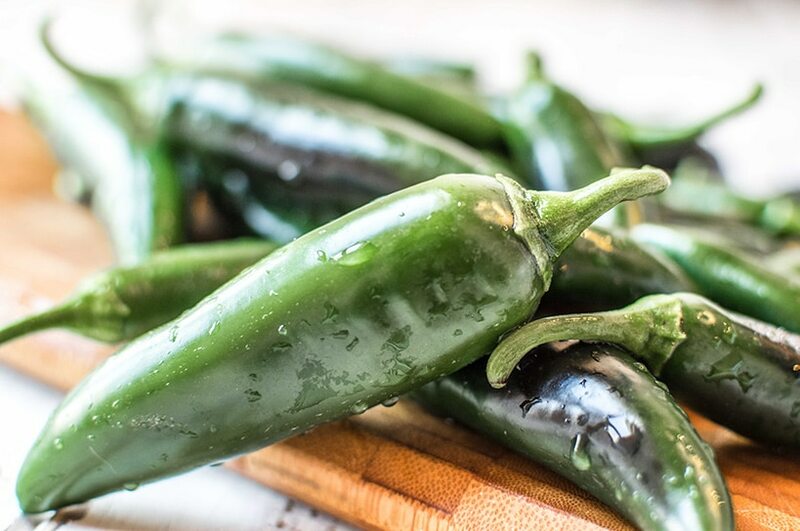 Do NOT try to process cold peppers from the refrigerator, your peppers should be room temperature when you add your brine. Slice your pickles into small rings and fill your jars leaving a 1/2 inch space at the top. My jalapenos were quite large this year, and I only needed a single pepper per 1/2 pint jar. If you want spicy pickles, leave the seeds. If you wish to have milder pickled jalapenos, you can remove the seeds. Removing the seeds requires a bit more processing time, but it does cool down the peppers. 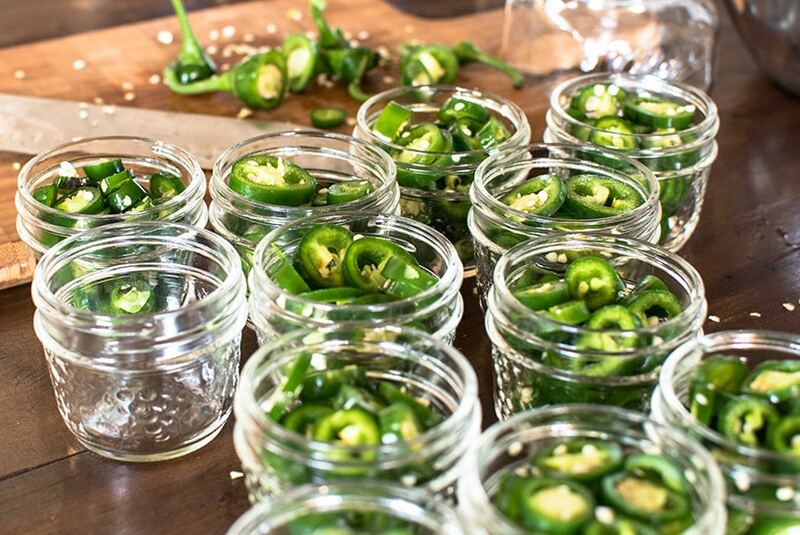 How to pickle jalapenos whole is just as easy, but requires a bit of additional prep work. To can whole peppers, you will need to slice them down the side or puncture with a fork. The inside of the pepper needs to fill with brine, so we need to create a way for that brine to get in. If you use the fork method, you want to ensure you pierce through the flesh and into the pepper. My husband had a permanently raised eyebrow as he watched me stabby-stabby my peppers. Add 6 cups of water, 3 cups of vinegar, and 3/4 cups of coarse pickling salt to a large pot. Bring to a rolling boil. Once your brine hits a rolling boil you can fill your jars to a 1/4 inch from the top. Use a knife to poke around your jars to remove any bubbles. Next, wipe your rims with a clean cloth or paper towel and add your lids, and rings and twist just finger tight. Do not over tighten your caps. Add your jars to your canner and process for 10 minutes for 1/2 pints and pints and 15 minutes for quarts. Remove your jars from your canner and leave them to rest undisturbed for 24 hours. Check your seals. If any did not seal properly, store them in the refrigerator to eat within a month. For the jars that did seal, your jalapenos are good for an entire year stored in a cool location. It’s a waiting game, much like homemade pickles. 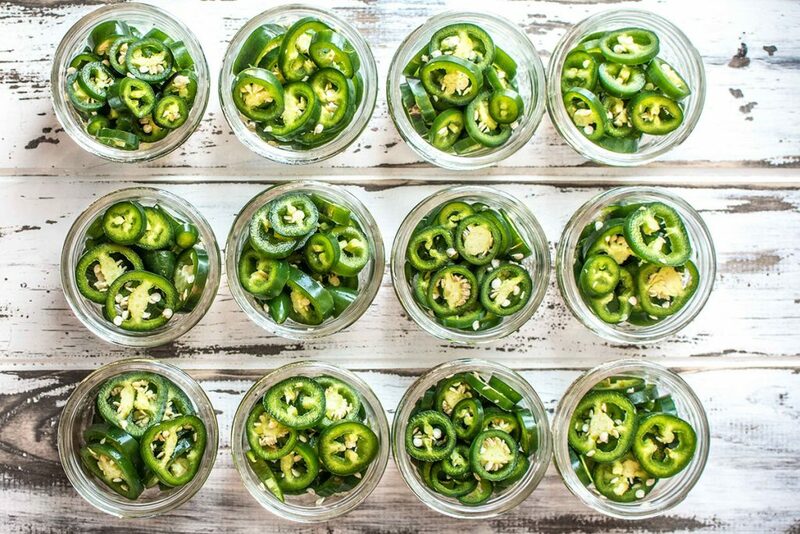 You’re going to have to wait two months before your pickled hot peppers are ready to eat. And that’s how to pickle jalapeno peppers – I told you it was going to be easy! 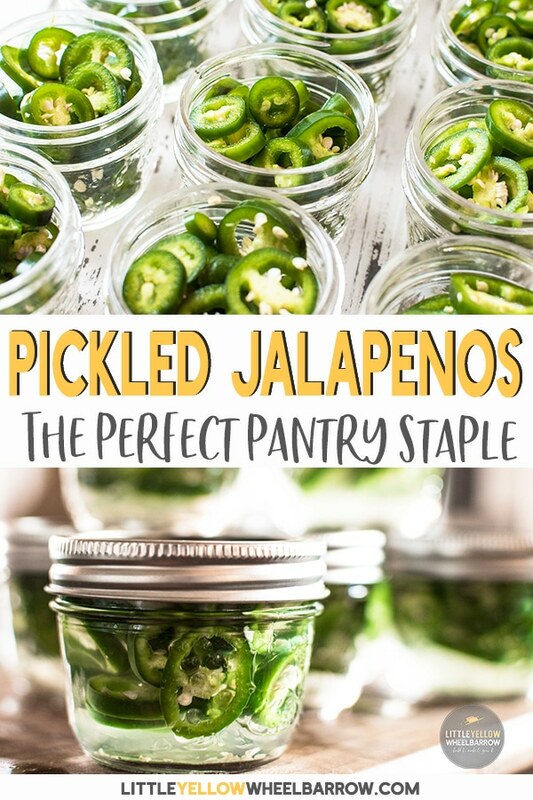 These picked jalapenos are easy to make and last for a year in storage. They had a spicy pickle punch to sandwiches, nachos, tacos, dips, and any savory dish that needs a bit of spice. Prepare your canner, jars, lids, and rings for processing. Clean jalapenos under fresh cold water. Dry, and allow to sit out on the counter to reach room temperature. Do NOT try to process cold peppers from the refrigerator, your peppers should be room temperature. 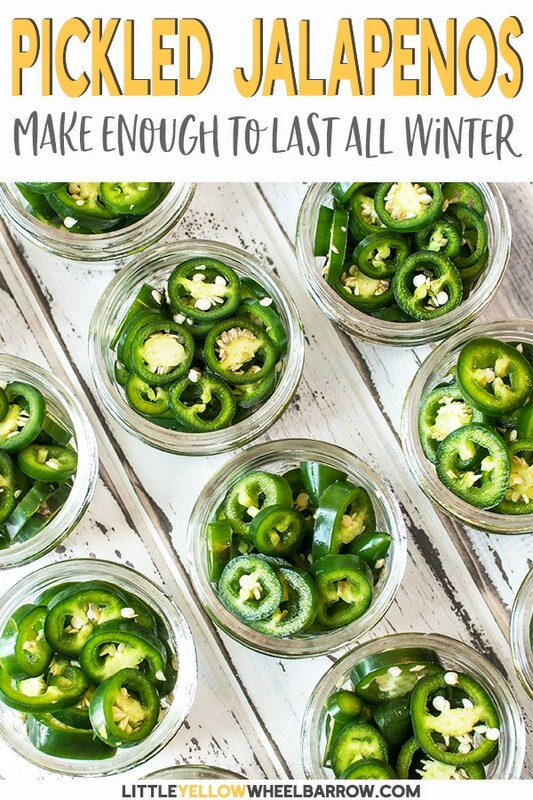 Slice jalapenos into small rings and fill jars to within 1/2 inch from the top. 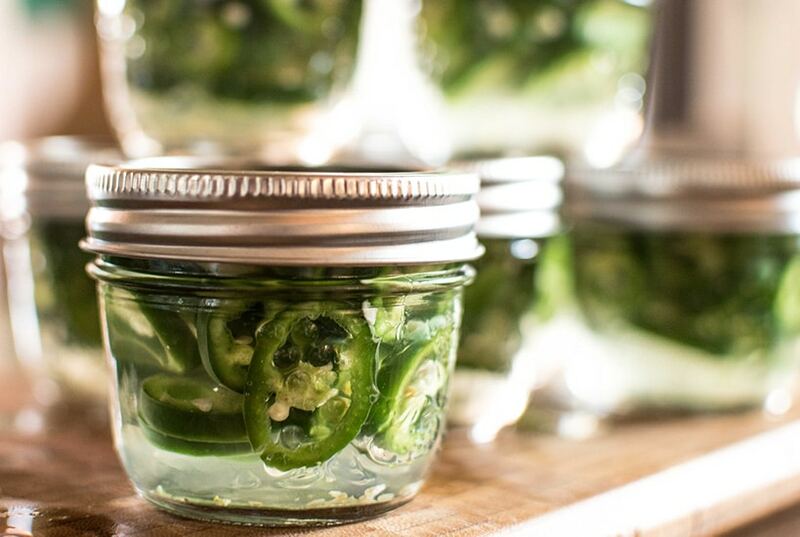 If you are making whole pickled jalapenos puncture, or slice your peppers to allow your brine to seep inside. Add your vinegar, fresh water, and pickling salt to a large pot and bring to a rolling boil. Carefully pour your brine into your jars using a ladle and a canning funnel. Fill to 1/4 inch from the top. Add lids and rings and twist until finger tight. Do not over tighten your rings. Process half pints and full pints for 10 minutes, for quarts process for 15 minutes. Remove jars from canner and place on a level surface. Leave undisturbed for 24 hours. Check seal. If no seal, keep in the refrigerator for up to a month. The sealed jars are good in cool storage for up to a year. I love to preserve food from my garden and have it on hand in the winter. There is nothing quite like a nice fresh jar of rhubarb jam, or a pumpkin pie made with homegrown pumpkins in the middle of a winter storm. Canning preserves that fresh taste of summer and adds such a wow factor to homemade meals and desserts. Seriously, this whole gardening thing started because someone said my homemade tomato sauce wasn’t actually from scratch because I didn’t grow my own tomatoes. Now that I do, I wouldn’t go back to a commercially canned sauce – ever. I will always have some kind of garden and a room full of fresh preserves. 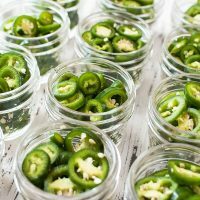 Learning how to pickle jalapenos is probably the easiest canning recipe ever, I highly recommend making a few jars for your pantry even if you’ve never tried canning before.